The SAP Plant Maintenance module encompasses the overall scope of maintenance procedures and functions for an organization. The subcomponents of the Plant Maintenance module include preventative maintenance, corrective maintenance, work orders/notifications, and management of technical objects. Preventative maintenance is executed on equipment before any faults can occur (usually at a time-interval or run-hour interval, depending on the specific type of equipment/machinery). The SAP Plant Maintenance module allows the scheduler to enter this information into SAP according to when the machinery/equipment requires servicing, and a work order is automatically processed at the correct time/run-hour interval. The purpose of preventive maintenance is to be proactive on issues that may occur in regards to equipment failure (i.e. changing an engine’s oil routinely or servicing brakes on a car) in order to prolong the life of the equipment. Corrective maintenance is also considered “repair” work and executed to get equipment working properly again. Sometimes corrective maintenance allows an organization to recognize what proactive or “preventive” measures can take place in the future on current equipment to prevent downtime. 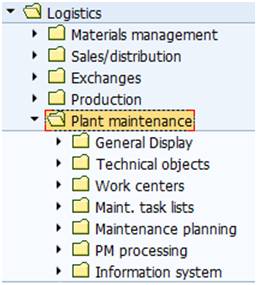 In the SAP hierarchy, Plant Maintenance is located under the Logistics tab and includes the general display, technical objects, work centers, maintenance task lists, maintenance planning, PM processing and information system, which all work together to create the Plant Maintenance module. Technical objects are the equipment, functional locations and materials that are all entered manually or uploaded from another program into SAP. 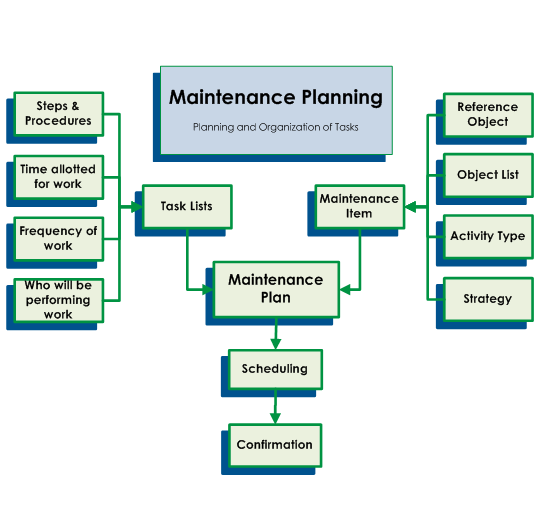 The Maintenance Planning tab is where the Preventive Maintenance plans and maintenance items’ transactions are located. In SAP, a Maintenance Plan includes a Task List and a Maintenance Item. These pieces work together and are scheduled to create a work order that the plant teams will execute. The Task List contains information such as plant information, operation title and steps, as well as the frequency and duration it takes to complete the task. The Maintenance Item includes the reference object and object list, which contains equipment pertaining to the plan. In addition, it gives the recommended type of maintenance (reliability, regulatory, etc.) and the Maintenance Plan, which includes the scheduling information. When viewing a Maintenance Plan, you will see the Maintenance Item and Task List information together on one screen (details can be drilled down). Preventive work orders are created from a Maintenance Plan and then dispatched to the correct department. If a piece of equipment is in need of repair, a corrective work order can be manually created instead of automatically driven from SAP. The expert consultants at Technology Transfer Services are available to assist you with anything industrial related, including SAP. Give us a call today at (813) 908-1100 to see what TTS can do for you!